The US stock market is once again back over 13000, people have spent the week eating turkey and shopping, and Christmas music is now once again playing as we move closer to the year end holidays. It would appear that things are once again okay in the world and you only need to turn on a TV or pick up a newspaper to read that very headline. Unfortunately, you come here for reality vs. fantasy, so we'll take a moment to look around the world at what is actually happening. 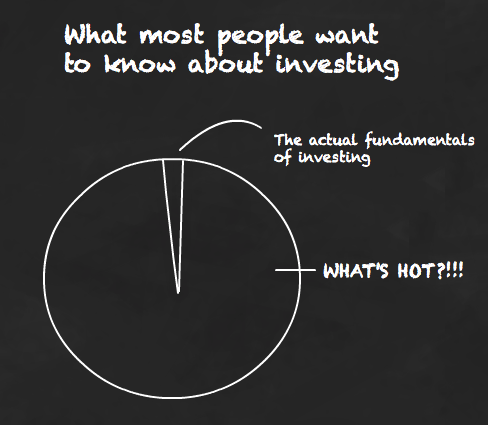 Last week we took a long look at the coming disaster in Japan through the eyes of Kyle Bass. This morning we briefly reviewed some the problems that France may face over the next year and beyond. Now we can turn our attention to the rest of the world. The following shows the most recent Markit Eurozone PMI manufacturing index. 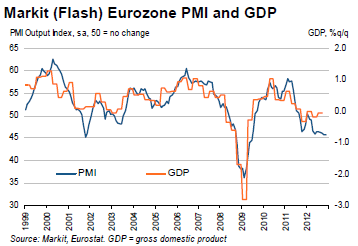 The Eurzone, as it continues to deal with its debt crisis, has seen a major manufacturing slowdown. GDP (orange line) historically tracks this index (blue line) and Europe is now right at the brink of (officially) crossing back into recession. Europe is part of the three major pillars of the developed global economy (along with Asia and North America), and any slowdown there will have a major ripple effect throughout the world. 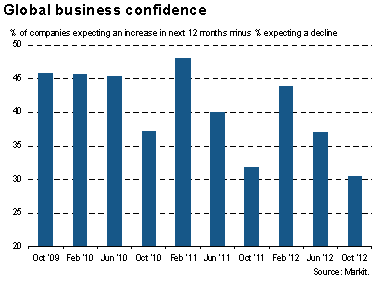 This ripple effect can be seen in the following chart showing global business confidence. Over 11,000 companies were surveyed worldwide and sentiment levels are back down to levels seen in 2009. The slowdown in European manufacturing has only magnified the problems seen in their employment sector. 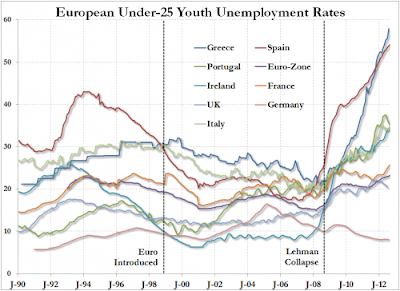 The following shows the under 25 youth unemployment rates in Greece (58%), Spain (54.2%), Italy (35.1%), and the Eurozone as a whole (23.3%). For those wondering how the people of Europe can find time to spend their days rioting on the streets, these incredible numbers sum it up perfectly. Back over in the United States the global slowdown continues to impact its economy as well. 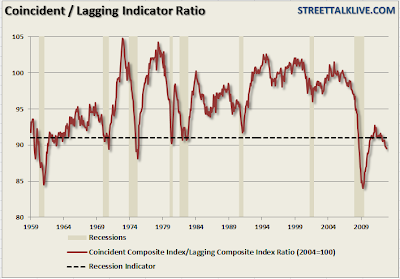 The following shows the coincident/lagging leading economic indicator index dropping to 89.5. 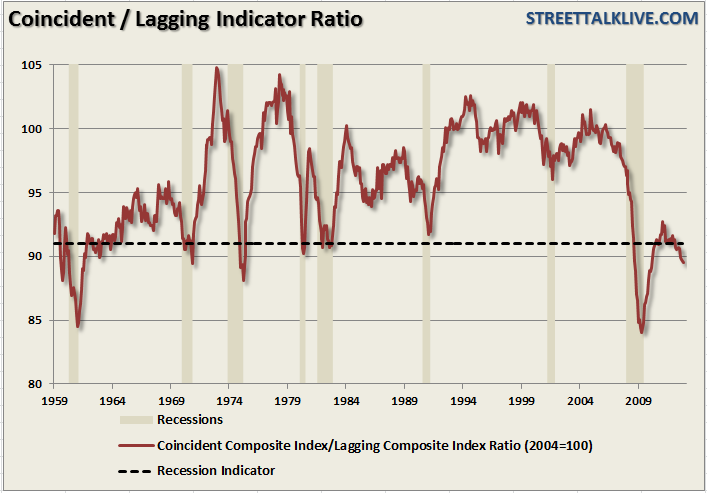 Going back to the 1950's, crossing below 91 has always led to a recession (grey lines show recessions). 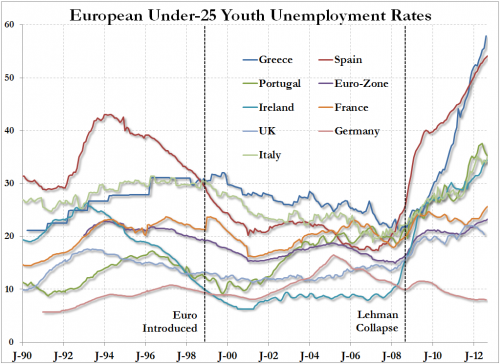 The chart also shows how weak the current "recovery" was compared to those in the past. This is the new normal for the US economy as the days of rapid growth are gone and a choking debt burden continues to tighten around the necks of economy. 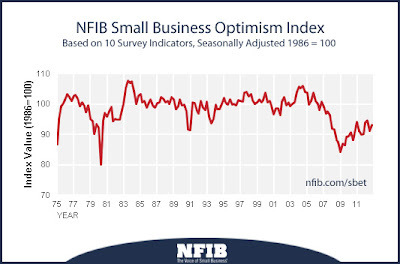 The small business optimism index in the United States paints a similar picture. The NFIB index never recovered from the last recession (which was actually the beginning of a depression), and only traced back up about 50% toward the previous highs. This number will continue to roll over as the current administration does everything in its power to make business investment as unappealing as possible. Get your DOW 13000 hot stocks while you can today. My guess is that they are going to be priced far lower one year from today and that of course is when no one will want to buy them.